I always enjoyed working with people so when I began my first massage class, I felt like I had found my career. In November of 2011, I graduated from Moraine Valley with my massage certification, and have been practicing ever since. My first job was at chiropractic office, and then in a spa. 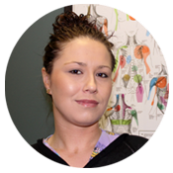 In late 2014 I moved Northwest Indiana and began my career with Bozovich Wellness Center. I truly enjoy working with the patients here, and always look forward to continuing education classes so I can learn additional techniques to use. In my time away from work I enjoy all outdoor activities and practicing yoga.